My Airtel App Free Internet Offer, My Airtel App welcome Offer, MyAirtel App Loot Free Airtel Internet Offer, Download My Airtel App and Get Free 1GB Internet Data for 3 Days- Hello friends, today i am going to share Airtel Free Internet Trick Offer. 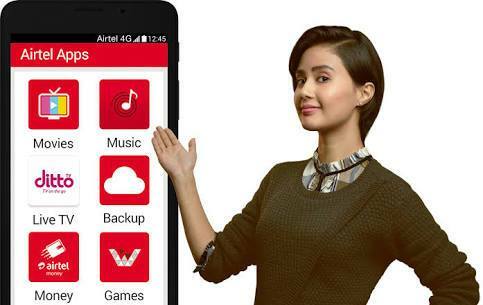 Airtel’s My Airtel app is once again back with promotional offer. This time offer is valid for new user only. Download My Airtel app & Get 1GB Free Internet Data for 3 Days. This offer is valid only for the new user. Just download then register and get Free 1GB data. This is just awesome offer, because on downloading of My Airtel app you will get 1GB free data. So hurry up and follow the below steps to get free internet in your Airtel number. NOTE : This Offer is valid for New Installs of My Airtel app & Unregister Airtel number. Enter your Airtel Number for Sign up (Offer is valid for New User). 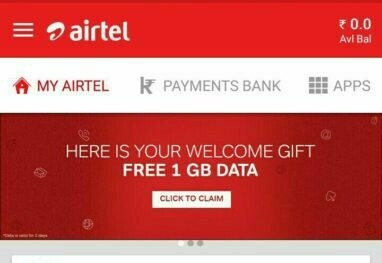 On Home Page you will get Banner of 1GB Free Data. Finally you will Get Free 1GB Data Instantly in your Number. Enjoy the Fee Internet in Airtel Sim. Offer valid for New My Airtel & unregistered Airtel mobile numbers users only. Free 1GB Data is valid for 3 Days Only.